What’s the only thing that’s worse than coming home to an apartment with an empty kitchen after a long, challenging day on campus? Try coming home to a student apartment that not only has empty cupboards, but also empty walls. Though we’re biased as a student apartment complex near the University of Akron here at the EnVision Apartments, it’s our firm belief that our tenants should enjoy where they live. That means creating a space inside of your student apartment that’s warm, inviting, and serves as a place that you actually want to spend time in. 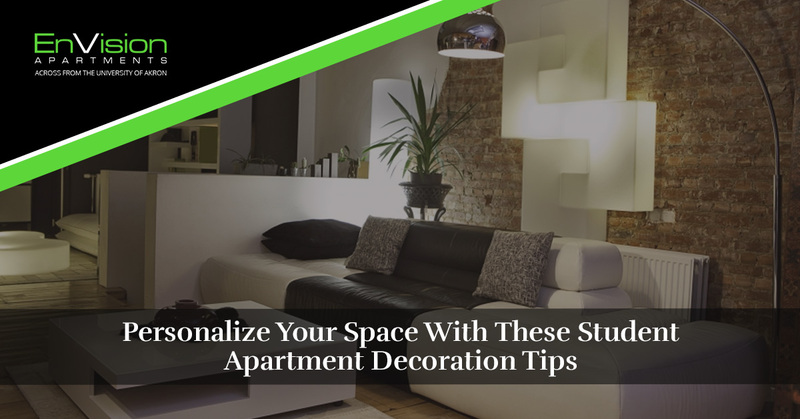 Fortunately, for those who are tired of blank walls and a lack of personalization, this blog post is going to cover some surprisingly simple tips and tricks to make your student apartment a true oasis away from the academic stresses of college. It’s true that the EnVision Apartments offer fully furnished Akron apartments just a few blocks from the heart of the University of Akron, but many of our units come empty. This means that it’s up to you to personalize and decorate your apartment space, making it a place that’s truly your own! So, let our Akron apartments cover things like an incredible location right next to campus, amazing amenities like Maggie’s Cafe, and multiple floorplans to choose from that work with your desired college living situation. At the end of the day, we know that you’re living here in Akron with one main purpose in mind: studying at the University of Akron to further your knowledge and career. Why stress about where you’re going to live during your experience? We have you covered! Keep reading below from our Akron apartments to get some insight about creating a place of your own (that won’t void the terms of your lease! ), or feel free to schedule a tour or contact the EnVision Apartments if you have any questions. Let’s get started! Why not? In terms of “I might be voiding the terms of my lease contract,” throwing a nice rug on the floor of your living room or even your bedroom is probably the safest way to go. Though high-quality rugs tend to get pretty expensive — especially large rugs — a simple, smaller rug from Walmart or Target is a great way to bring life to the floor of your student apartment without breaking the bank. Lighting can have a rather dramatic impact on your mood, and coming home to a dingy, dreary living room after a long day studying just isn’t good for your mental health. Now, our Akron apartments aren’t necessarily suggesting that you remove our lighting and re-install your own fixtures (seriously, please don’t do this), but adding your own personal touch with a reading lamp on a coffee table or even stringing holiday lights in your bedroom will do wonders to add a new light to your apartment space. Are you a bit of an avid photographer? Consider decorating your apartment on the cheap by filling up blank wall space with a collage of photographs. Getting photos printed isn’t much more expensive than buying posters for wall art — plus, you’ll be adding a nice, personal touch to your living space that generic posters from a big box store could never provide. Think of a photo collage on your wall as a constant reminder of the friendship and unwavering support that your friends and family offer. Feeling a little bit claustrophobic inside your Akron apartment? Though our student apartments are rather spacious in our forever-biased opinion, we understand the desire to have more space. This is especially the case when you’re living with one or more roommates. Hanging up a large mirror in your living room behind the couch will give the illusion that your living space is larger than it actually is, and the mirror doubles up as a way to constantly check yourself out. That’s a win-win in our book! Purchasing high-quality prints and paintings to decorate your wall space tends to be nothing shy of expensive. If you’re not too fond of our photo gallery idea above, then it may behoove you to befriend an artist of sorts and acquire some of their work. Seeing as everyone is their own harshest critic, you’ll probably be able to score some cheap art or even some pieces of work that the artist in question no longer cares about because it’s “terrible.” Of course, to those of us who aren’t so artistically inclined and can’t draw more than a simple stick figure, what they created probably looks incredible. If you’re the least bit thrift savvy, then you’re in the know about the fun, random and downright impressive items waiting to be discovered in thrift stores. From insane furniture deals to wacky decor and more, a visit to a thrift shop in Akron may be the key to apartment personalization. Your job is to be a student at the University of Akron, and our job is to provide you with unbeatable apartment value and amenities. Fortunately, we do our job well! Contact the EnVision Apartments today to learn more.